No more posts here – so update your bookmarks. Well, we’ve been told those changes to Wiki we talked about were actually made by one of the authors mentioned – who has now taken down the reference to the other author mentioned (at his request we understand), and modified the entry in other small ways. We have to say we originally thought it had been done by some random troll – because the wording and the sentiments just didn’t seem like something that would have come from the author herself. If we’d known, despite all outward appearance, it had been written by the author named we would have approached it in a less satirical way, and we’re sorry for that. But we have to admit we are if anything even more baffled by the whole business! What purpose is there in creating imaginary divisions between us? In quibbling between ‘myth’ and ‘comprehensive misrepresentation’? If we agree then let’s celebrate it, not pretend we don’t. Oh – we’ve closed the poll too, as it’s probably a little insensitive now we know the true provenance of the Wiki comments. Though, even though intended it as a little joke, it’s yielded some interesting results we might share later. Just a bit of fun, ‘Charles1832’, don’t burst anything. (And please don’t post multiple replies we just have to delete). We just think it’s time for people to stand up and be counted! We’ve been fatally distracted from this blog by our Other Lives, but someone (thank you JedO) just told us about a little something on Wiki we had to pass on. 1. Edward Wakeling does not maintain there is ‘no myth’, in fact he has a link on his own website entitled ‘Myths About Lewis Carroll’, with a long list of said myths, many of which are identical with those we examine. 2. Anyone have any idea what the difference is between a life that is mythic and one that has been ‘comprehensively misrepresented’? Or what “this can be attributed to Carroll’s own behaviour and in particular his tendency to self-caricature in later life” actually means? That poor Carroll was responsible for all the lies and nonsense said about him for a hundred years and more after his death? And that means, somehow (how?) that there’s no myth? Just a ‘comprehensive misrepresentation’ that is all Carroll’s own fault? Correct me if I’m wrong but isn’t this semantic gibberish? We have no idea who wrote this, but we think Mr W and Ms W should probably be informed in case they want to make changes. Did they really think it had its own website? Please tell me they were wrong! Just realised today – there’s an anniversary coming, and it’s a weird one. The Property of a Gentleman. 76. DODGSON (C.L.) 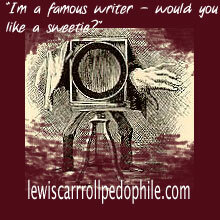 “Lewis Carroll”. 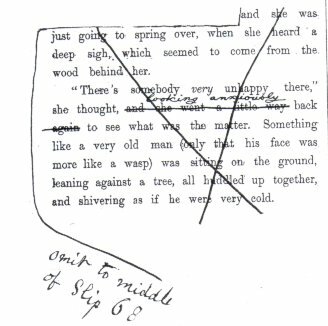 GALLEY PROOFS FOR A SUPPRESSED PORTION OF “THROUGH THE LOOKING-GLASS”, slip 64-67 and portions of 63 and 68, with autograph revisions in black ink and note in the author’s purple ink that the extensive passage is to be omitted. *** The present portion contains an incident in which Alice meets a bad-tempered wasp, incorporating a poem of five stanzas, beginning “When I was young my ringlets waved”. It was to have appeared following “A very few steps brought her to the edge of the brook” on page 183 of the first edition. The proofs were bought at the sale of the author’s furniture, personal effects, and library, Oxford, 1898, and are apparently unrecorded and unpublished. Nothing further was known about this episode, beyond the fact that Dodgson apparently gave in to Tenniel’s pleading and removed the undrawable creature, since the ‘wasp in a wig’ never appeared in the finished book. It was assumed that the text was lost, leaving a litter of unanswered and unanswerable questions trailing. — Where had this mysterious insect originally been located ? How had it fitted into the story? And what sort of creature had this wasp in a wig been? For years scholars speculated on these things, with many suggestions being made. Then, in 1974, the above announcement appeared in Sotheby’s catalogue and the world learned that what purported to be the galley proofs of this long lost chapter of ‘Looking-Glass’ was suddenly being sold in a London auction room. As can be imagined this caused a sensation in the literary world. Carrollians collected from many corners of the globe for the sale on July 3 1974. Some just wanted to catch a sight of the treasure trove of original Lewis Carroll galleys, others were there to try and get the treasure for themselves. The galleys were eventually sold to a New York book dealer called John Fleming, for £1700. It later developed that Fleming was acting as an agent for Norman Armour Jr. of New York. 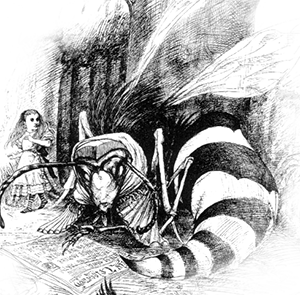 In the same year the Lewis Carroll Society of Great Britain held a special Symposium to discuss ‘Wasp’ and Gherhardts’ doubts were echoed and added to by several leading members, most notably Selwyn Goodacre, who pointed out some significant problems with the apparent location of the new material. Objections and questions were raised on numerous aspects from the poor quality of the writing, to the identification of the handwriting and –repeatedly – the assigned provenance, all of which were found to be at least dubious, and calls were made for serious testing of the paper, the ink and the type to be done. But despite all this, nothing happened. No expert examination of the galleys was done at all. It’s probably not that surprising in some ways. The new owner had little incentive to have tests done that might show his investment was a dud. But the behaviour of the literary and Carroll communities is less easy to explain. Not only did they stop calling for the Wasp to be examined more thoroughly, but many of the leading Carroll experts of the day began to behave as if such tests were simply not needed. As if the Wasp was proved to be genuine simply by being there. 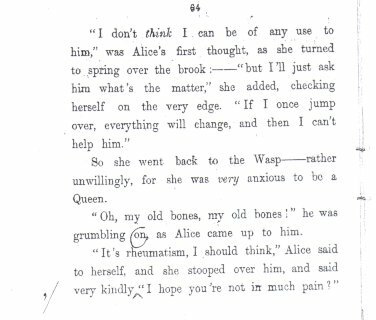 Not long after the sale the new owner granted permission for a facsimile to be published by the Lewis Carroll Society of North America, and this was the beginning of a pretty high profile and celebrated literary career for our Wasp. It appeared in several editions of Through the Looking-Glass, ‘reinstated’ in its presumed original position. It was included in a prestigious TV dramatization in 1998, and was the subject of several critical analyses by high profile Carrollians such as Martin Gardner and Morton Cohen, and illustrated – beautifully – by Ralph Steadman.None of these publications questioned for a moment that the ‘ Wasp in the Wig’ was anything but genuine. Few even discussed the question of its authenticity, let alone suggested there might be doubts. And gradually, it seems, people have forgotten there ever were such doubts at all. Google ‘Wasp in the Wig’ today (go on – do it now), and you’ll find very little reason to think it’s anything but the real deal. You’ll turn up hits for its several publications, and for numerous articles detailing how the ‘lost’ galleys came to be found, all telling the Sotheby’s provenance story as if it was an established fact. You’ll find the details of the re-sale at Christie’s in 2005, again putting across the same provenance – though qualifying it with a ‘presumably’. But if you’re like me, you’ll find only two sites even acknowledging the fact this thing has never been proved to be real. In 2005 I managed to persuade the then-owner -Norman Armour Jr’s daughter – to agree to a collection of tests to establish authenticity. We had a team of experts ready to begin the work in London once we had managed to figure how to transport the precious cargo from the United States. Things were looking promising. But, at the last minute, the lady decided the time wasn’t right. The tests remained un-performed. A few months later the Wasp was put up for sale again, this time at Christie’s. The estimated sale-price was $60-70,000 . So, today, 36 years after it first emerged from oblivion, the Wasp in the Wig remains an unknown quantity. Not a single expert has ever examined the original artefact. No one has tested the paper, compared magnifications of the type face with authentic Looking-Glass first editions, compared the handwriting with Dodgson’s own, dated and analysed the ink. Which raises the question – is it real, as almost everyone seems to assume? Or is it a superficially clever fraud? 1.The lack of any provenance prior to its appearance in the Sotheby’s sale room in 1974. As we said above, this is a major problem. The story of its origin offered in the Sotheby’s catalogue was at best an error, and at worst a lie. So, where had the Wasp actually spent the previous 76 years before turning up for sale, courtesy of a ‘gentleman’ who preferred not to be identified? 2. Its quality. Frankly, it’s just bad. The language is clunky, and in some places gives an unnerving impression of being a sort of Alice-pastiche. The poem barely scans, and this is significant, because even at his worst, even in the depths of his most cloying poetic banality, Carroll knew how to turn a graceful bit of metre, so if he wrote this he was not just being bad he was being bad in a pretty uncharacteristic way. Other issues are open to debate. Does this ‘lost chapter’ fit with Carroll’s ‘illustration plan’ for Looking-Glass discovered some while ago? Some argue it does, some that it doesn’t. Does the handwriting resemble Carroll’s? The examples are so small it’s hard to say, especially as no handwriting expert has yet been allowed to examine the text. Until they are, and until the whole document can be given over to long-overdue scientific analysis, it remains horribly possible this much-vaunted, published and critiqued ‘lost chapter’ is a Carrollian Oath of a Freeman. Understandably, there are now a lot of people with an investment in not stirring this particular pond. The current owner doesn’t want to see his investment turn to dust (I mean who would?). The various experts who have endorsed it don’t want to risk looking silly if it turns out to be a fake. The various collectors don’t want their limited editions ‘Wasp’ facsimiles etc to be nothing but careful copies of a faker’s art. Thirty-six years on, is there any motive left for investigating this orphaned insect? Is it better just to let it d be what everyone already says it is? I mean, in a world of oil spills and psyops what does it matter? Well, yes, you can argue that. But I think it does matter. Because it’s a question of truth. And truth matters for its own sake, even in small ways. I think we should be grown up enough to find out for sure if this thing is what we’ve all said it is for so long. And grown up enough to risk finding out it actually isn’t.